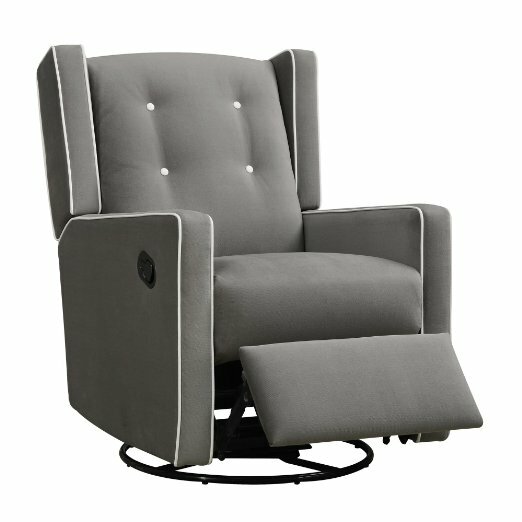 The Baby Relax Mikayla Swivel Rocker Recliner provides style and comfort. If you’re shopping for a swivel rocker recliner, chances are you’re searching for a chair that can really deliver on comfort. The ability to rock or recline allows you to relax in whichever way you feel more inclined. These chairs can be fantastic additions to living areas, and are also popular chairs for nurseries. We’ve put together a comparison chart of stylish and highly-rated swivel rocker recliner models to help you get a sense of some available options. Continue reading after the comparison chart to get more details on a few of the models that really stood out to us. Hopefully the comparison chart above is useful in getting a quick sense of the variety of swivel rocker recliner models that are available at different price points. Below we cover a few of our favorite chairs and dive into why they got our attention. The style of this chair makes it look so inviting and cozy. It’s not surprising that it’s marketed for use in nurseries! With that said, the Baby Relax Mikayla Upholstered Swivel Gliding Recliner would be an attractive addition to just about any living space as well. Lets look at its function before we look at its form. This chair has an enclosed ball bearing mechanism that allow it to have a seamless a rotating swivel and a smooth gliding motion for rocking. Its seat is filled with spring core foam to provide users with extra support. 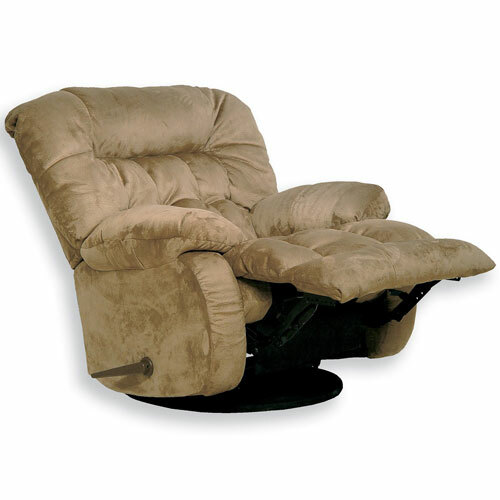 It reclines via a built-in easy-pull mechanism, and can be reclined partially or fully. The one real functional downside is that the footrest is pushed down by the user’s legs, and it can be slightly difficult to push down. Now for talking about this chair’s style. It is available in two soothing neutral colors, Gray and Mocha, and both colors feature white piping and button details. The tufting and cushy look of the seat and back make this model appear exceptionally welcoming. The chair’s subtle wingback adds another touch of style to the overall appearance. The Franklin Mayfair Swivel Rocker Recliner is a traditional chair that for many may be reminiscent of grandma’s house. It is upholstered in chenille, and features button tufting details on the its backrest. The cushions for this chair are made of premium springs and gel injected seating foam. This combination is exclusive to Franklin. They refer to this material combination as their Wow Seating System. The reclining mechanism is a lever located on the right side of the chair. The footrest is also put back down by returning the lever to its original position. 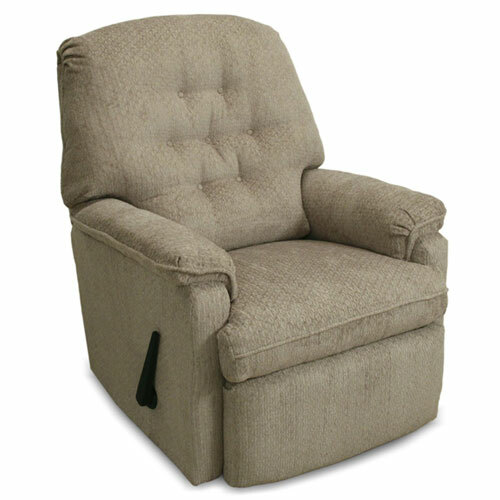 It is a smaller scale recliner, measuring 30.5 inches by 33.5 inches by 39.5 inches. The diminutive nature of this chair means that it is best suited to people of smaller stature. All Franklin chairs are made in the USA. Almost all you need to know about the CATNAPPER 45175222029 Teddy Bear Saddle Chaise Swivel Glider Recliner you can glean from the first word of its name. This chair was made to be a place to snooze. Plush cushioning in the seat, back, and arms of this chair make it easy to sink in to. The soft polyester fabric upholstery adds to the chair’s comfort factor as well. This model is one of the most expensive on our list and that is due to the quality of the chair’s build. The Catnapper is composed of a 100% steel seat box, a unitized steel base, and premium springs. Many other chairs instead use plywood and lesser quality springs. The general consensus is that this chair is delightfully comfortable and well-suited for people of various sizes. What about recliners for short fat people?